Unique design allows for easy transportation of jib crane with a fork truck. Empty base models include instructions for proper filling with concrete. 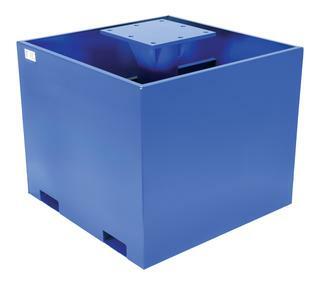 Base measures 42-3/16" W x 42-3/16" D x 18" or 36" H and includes built-in fork tubes. Fork tubes are 7-5/8" W x 2-5/8" H usable on 24" fork centers. Fixed length I-beam will pivot 360° for complete access. Under I-beam clearance is 10'. Upright vertical column bolts to base. Unit not for use as a fork truck attachment. Additional Steel Bases also available – please see Options tab for details. 18"H Base requires forty-one 60 lb. bags of concrete mix. 36"H Base requires eighty-two 60 lb. bags of concrete mix. Steel construction with a painted blue finish.